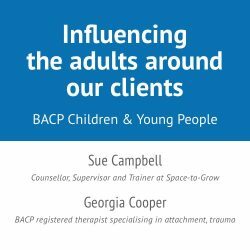 BACP (British Associate for Counselling & Psychotherapy) have published Influencing the adults around our clients by Sue Campbell and Georgia Cooper in their journal Children & Young People. The article describes the ‘Nurturing Parent programme… a project in Leeds to help parents understand the role they have in their children’s emotional wellbeing, and how their own state affects the family’. Based on PACE and the work of Dan Hughes, Sue takes us through the rationale and practice of using PACE – Play, Acceptance, Curiosity and Empathy – when working with parents. We are passionate in our belief about the need to nurture our parents so that they can begin to explore their parenting styles and their own parenting. We make the theoretical content easily accessible and, crucially, we set out to model the PACE approach with our parents. BACP have given the DDP Network permission to reproduce the article, available for download in the DDP Library. The article first appeared in the June 2017 issue of BACP Children & Young People, published by the British Association for Counselling & Psychotherapy © 2017, and the copyright remains with them.